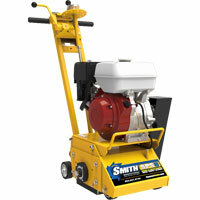 Rugged, Dependable & Versatile – The SMITH SPS8™ is a compact, rugged scarifier for easy surface preparation on concrete or asphalt. 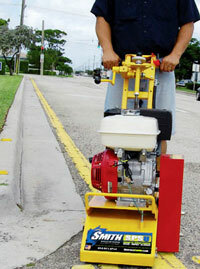 This all-purpose scarifier is easy to own, operate, and maintain, with maintenance-free bearings, long-lasting cutter drums, fast-removing cutters, feathering wheel, and optional edger attachment. Best for parking lot lines, leveling high spots, coatings, epoxy, raised sidewalks, flaking paints, thermoplastics and more. Used by contractors for mid-size removal jobs.